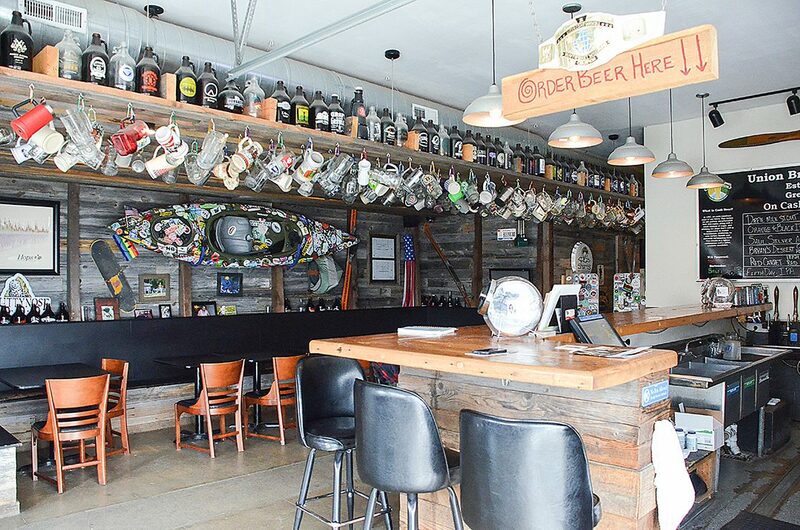 Nathan Doyle said the idea for Union Brewing Company stemmed from a time when he and his friends couldn’t find an ideal place to hang out and drink beer. Doyle was homebrewing at the time, so he and his friends pooled their money to see what they could do. Doyle, however, said they didn’t want to open a regular brewery. Instead, they opted for firkins, or cask-style beers. A tap beer is force-carbonated, like a soda. In a cask beer, the carbonation process occurs naturally. To make a firkin, after the beer has been brewed and fermented, it is stored in a 10.8-gallon cask along with a sugar that the beer yeast consumes. Firkins derive their name from the vessel the cask beer is stored in, not the beer itself. 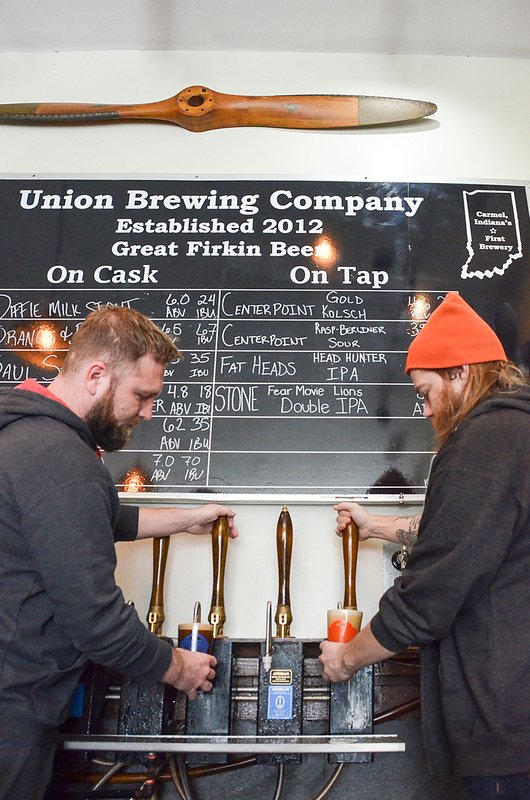 Pennington said he believes UBC is the only brewery in Indiana that brews strictly firkins, and he said only a handful of breweries across the U.S. do so. Many breweries don’t go the firkin route because the expense is higher than tap beer, and firkins aren’t easily distributable. A piece of equipment called a beer engine is required to pour the firkins, which costs approximately $500. A normal beer tap may only be $100. A beer engine is a pump that draws the beer out of the cask. The two partners who launched UBC with Doyle in 2012 have since left the company, and he brought on another partner, Cary Hudson, in 2015. 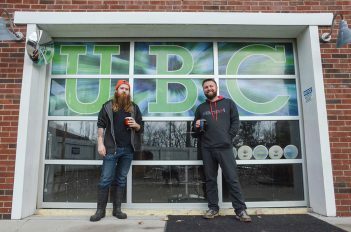 For more on UBC, visit unionbrewingco.com. UBC’s interior has the aesthetic of a homey lodge, featuring rows of growlers and glass mugs, a kayak covered in stickers and large garage doors that let in plenty of light. Day 1: A 10-hour process starting with barley and grains. By the end of the day, the brewer has a bunch of what Union Brewing Company head brewer Matt Pennington calls sugar water. Day 2-12: The sugar water goes into a fermenter with yeast and sits for anywhere from 5 to 10 days. Then the brewer drops the temperature, which allows the solids to fall out of the liquid. Liquid is pulled and stored into casks. Day 13-27: The beer is stored for two weeks in a cask to self-carbonate. Typically, Pennington makes enough beer for 11 to 15 casks at a time. Curious. Will they be able to afford the new rent? How long will they be able to stay in business when they won’t be taking in any money? It will take a few years while they tear down Elliot’s Mohawk Place, build a parking garage with matching Disney brick buildings. So what’s their address, hours, etc.? Current publishes these articles about new places but they never give you the stuff you really need to know.